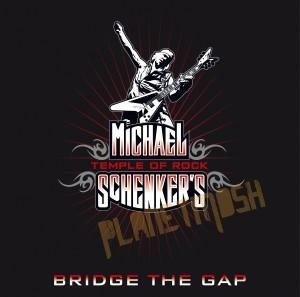 If Michael schenkers last album, Temple of rock was him moving away from a solo career , and being part of a band again, then this latest offering “Bridge the gap” is heading in the right direction, as this new release is called Michael Schenker’s Temple of Rock: Bridge the Gap. The first ‘Temple Of Rock’ album featured a variety of players and vocalists who had worked with Michael over the years. This album however, features the now stable line up with Michael on guitar, Wayne Findlay on guitar and keyboards, Doogie White on vocals, and the pairing of former Scorpions rhythm section Francis Buchholz on bass, and Herman ‘Ze German’ Rarebell on drums, quite a mouthwatering line up. Having Doogie White as your vocalist and writing partner must have been an inspired choice for Michael, as this album contains 13 tracks of pure magic, yet with a strong band feel. Michael does have his moments, off course, yet his playing and solos tend to flow better, he seems to fit in as part of a band, rather than the band fitting in with him. A trademark Schenker instrumental track ‘Neptune Rising’ leads us nicely into ‘Where The Wild Wind Blows’. The song has a pulsing, rhythm driven riff which builds ominously before breaking into a catchy and melodic chorus. Schenker and White never stray too far from this songwriting path, and indeed there are times throughout this album that you can hear a touch of Rainbow and Dio. There is even a Hammond organ. So given this desire to blend the old and the new, Temple of Rock have come up with an enormously pleasing album to fans of classic rock. ‘Horizons’ is for me one of the album highlights. Again another great driving riff underpinned with rapid double bass drum work from Herman Rarebell. The irresistible epic ‘Lords Of The Lost And Lonely’ which is classic Schenker, inventive playing with a teasing , eastern tinged riff. The track ‘Rock n Roll Symphony’, is almost a homage to classic rock itself, which features some great Hammond organ from Wayne Findlay with Doogie using a number of classic rock song titles woven together to make an entertaining song, very tongue in cheek. The album features 13 tracks in total and the quality just shines throughout. Other tracks of note include: ‘Land Of Thunder’ which has Rarebell and Buchholz on full throttle, a very powerful, hard driving track. ‘Bridges We Have Burned’ which is another heavy brooding masterpiece. ‘Because You Lied’ is perhaps the most unusual track on the album, featuring a stabbing riff from Schenker, some off center drumming from Rarebell, and an odd vocal from Doogie, mainly because it is drenched in echo. Michael has a loyal fan base that has willed him on and stuck by him through periods of personal challenge. In recent years he has repaid that faith with a run of excellent tours and strong Albums, long may this line-up continue, as I think this band, as a whole have a lot left to deliver.